Skitch is a wonderful screen capture and markup app from the folks at Evernote. Skitch can serve as your primary screen capture app, easily replacing the older Grab utility that's included with your Mac. Even better, it goes Grab quite a few features better, including the ability to annotate a screenshot with arrows, text, shapes, and stamps. You can even perform basic cropping, without having to import the image into your favorite image editor. Integrates with Evernote to save to your Evernote account. Supports PNG, JPEG, TIFF, GIF, BMP, and PDF formats. Doesn’t offer to save a note when quitting the app. Doesn't save to your local Mac drive; must use export option to save. Skitch combines a screen capture app with an editor that allows you to capture and then edit your image, all in the same app. There are actually quite a few screen capture apps that use this same idea, but Skitch is available for free, which is a not inconsiderable advantage. You don't even need to be an Evernote user to take advantage of Skitch, although you'll need an Evernote account to make use of the cloud storage and syncing services. Since one of this app's main features is to capture the content of your Mac’s screen, the user interface for the capture feature is an important consideration. Ideally, a screen capture app can stay out of the way while you work to set up the image you wish to capture, and then allow you to easily invoke the app when needed. Skitch stays out of the way when capturing an entire screen, or even a timed screen. However, when you wish to grab other basic shots, such as a defined window, a menu, or a defined area, Skitch demands to be the center of attention. This isn’t a bad thing, just not what's normally expected. On the other hand, Skitch works very well at its advanced capture modes once you get used to some of the peculiarities, such as having your entire display dimmed and overlaid with crosshairs when capturing an area of the screen. The Skitch editor is where you'll likely spend the most time, assuming you're going to be editing the captured screenshot. The editor is a single window with a toolbar across the top, a sidebar containing annotation and editing tools, and an information bar along the bottom. Most of the editor window is taken up by the image area, where you'll perform your edits. The annotation tools all work well and are easy to understand. The last tool in the sidebar is for cropping your image. Skitch can either crop an image or, using the same tool, resize the image. Resizing keeps the same aspect ratio as the original to ensure the image doesn't become distorted as you change its size. The crop tool outlines the image, placing drag points at the corners. You can then drag each corner to define the area you wish to keep. Once the crop box is where you wish, you can apply the crop. Crosshair Snapshot: Using a set of crosshairs, you define the area on the screen to capture. Previous Snapshot Area: This allows you to quickly repeat a snapshot; you could also predefine a snapshot area, and then capture some type of action within the defined area when it occurs. Timed Crosshair Snapshot: Similar to the Crosshair Snapshot, but once you define the area, the snapshot will be taken using a 5-second delay; handy for capturing an event in the area, such as a menu being displayed. Full-Screen Snapshot: Produces an immediate snap of your entire screen. Window Snapshot: Allows you to select a window whose content will be captured. Menu Snapshot: Will grab the image of the next menu you select. Camera Snapshot: Grabs a single frame from your Mac’s camera. You can create a reasonable approximation by using the Timed Crosshair Snapshot and then defining the entire screen with the crosshairs. The difficulty comes with the countdown clock not being visible when you use the Timed Crosshair Snapshot in this way. Skitch takes a middle ground approach in the screen capture app arena. It doesn’t try to be a powerhouse app, with so many bells and whistles that you'd need a detailed user guide just to be able to use the app. Instead, Skitch offers a very good selection of tools and features that you're more likely to use on a daily basis, and it makes each tool easy to use and understand. 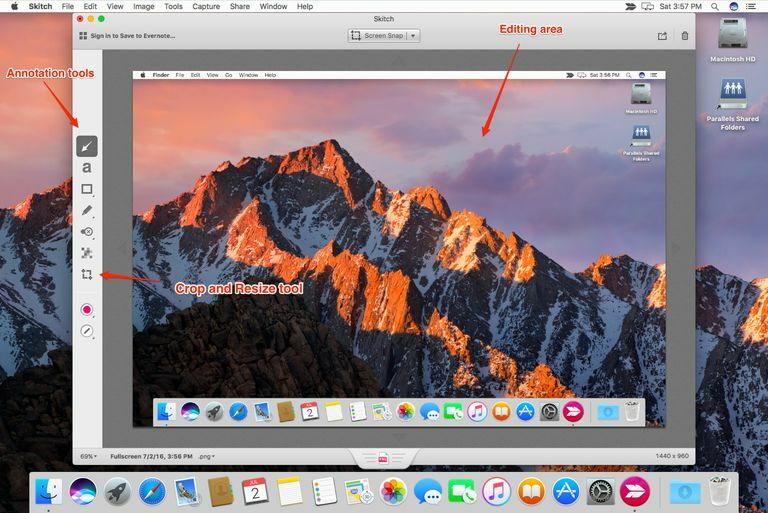 Although I've given Skitch a few knocks in the course of this review, overall I found it a very useful app, one that can easily replace the Mac’s own built-in screenshot functions. It can even replace the separate Grab utility that's hidden away in the /Applications/Utilities folder. Perhaps the only thing I wish the folks at Evernote would fix is the cumbersome Save/Export capabilities. If you're signed in to your Evernote account, you can easily save your screenshots to your account. If you're not signed in, or you would rather save an image directly to your Mac, you have to use a separate Export command. Come on, Evernote; just use a single Save command like everyone else, and use the Save dialog box to choose where you want to save the image to; is that so hard? Skitch is free and available from the Mac App Store.